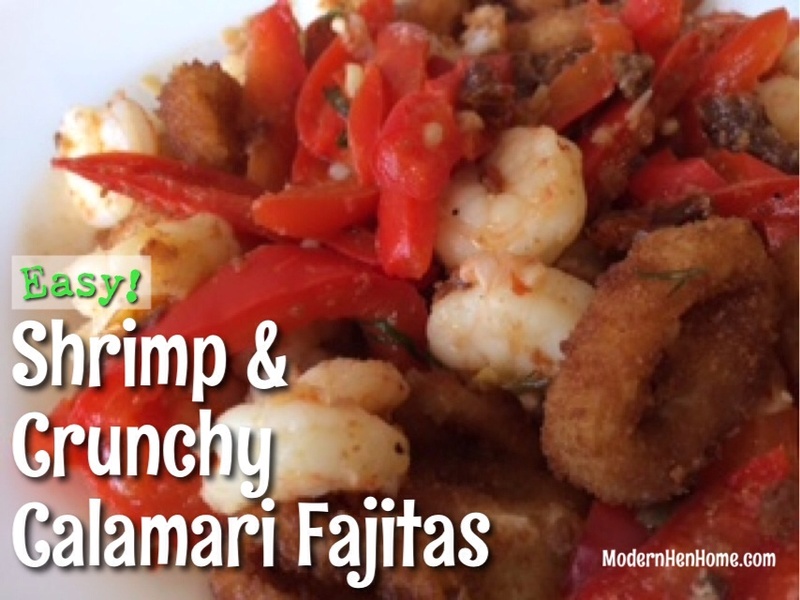 I had a craving for shrimp fajitas and while gathering ingredients to make them I noticed a box of frozen breaded calamari rings in the freezer. 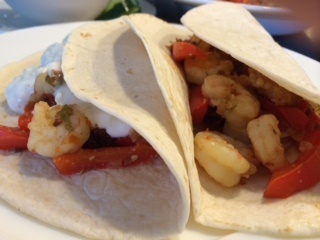 Sauteed shrimp and crunchy calamari in a fajita? Sounded good to me! Plus mixing the two together was an inexpensive way to serve the family a lot of good food without breaking the bank. Fresh shrimp can be pricey and we love to eat! To keep calamari crunchy add the baked rings to the shrimp and vegetables last, then top with Tzatziki sauce (recipe below). 1. Prepare Tzatziki (recipe below). Cover and refrigerate until serving. 2. Heat oven for calamari rings per box directions. (Tip: A slightly oiled black cast-iron skillet crisps breaded foods nicely in the oven.) In large skillet on medium high heat add olive oil and saute garlic and crushed red pepper, 1 minute. Add onions and red bell peppers, cook until slightly brown, about 3 minutes. Add about 1/4 cup water, cover and cook until tender. 3. Bake calamari rings in the oven as directed. 4. Add onion powder, salt, Greek seasoning, sun dried tomatoes and raw shrimp to the pan and saute until shrimp are cooked through, about 3 minutes. Pour into serving dish and top with fresh cilantro. Scoop baked calamari rings onto a separate serving plate. 5. Warm soft tortillas, two at a time, in microwave about 18 seconds. 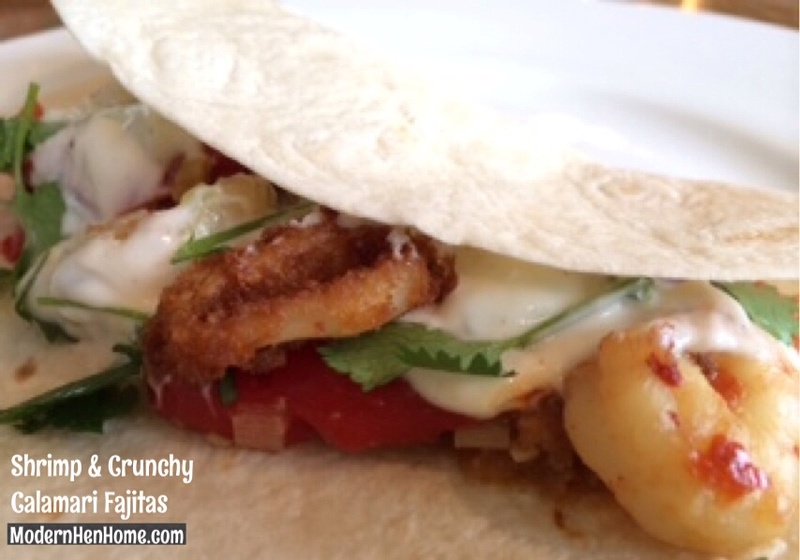 Add cooked shrimp and pepper mixture to the center of the warmed tortilla, top with 3 to 5 calamari rings and a large dollop of Tzatziki sauce. Makes 8 fajitas.